National Granite first opened it's doors in Burbank in 1990. With the goal of providing customers with the best possible stone at the most reasonable price. At National, we work hard to educate everyone who. National Granite specializes in fabrication and isntallation of Marble and Granite Kitchen Countertops, Vanity Tops, Bath Floors, Walls, Outside Kitchens, Tub Deck, Wet Bars, Fireplace Surrounds, Patio Decks, Back Splashes, Walls, Wal Fountains, Pool Surrounds and Table Tops. National Granite was created with the understanding that service, dependability, craftsmanship, affordability, and customer satisfaction are Marble and Granite by Design's highest priority. 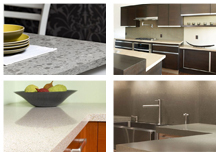 We always strive to offer superior service and friendly help to our marble and granite clients. By taking the time to listen and understand your expectations, we help you to design and inviting home where the beauty and elegance of marble or granite can bring an air of comfort to all who gather there. There is a great deal to consider when investing in stone for your home or office and at National Granite we take pride in our effort to teach our customers. We have families just like you and like you we work hard for our money. We know that investing in natural stone products just like any investment that you most often you get what you pay for, in stone quality as well as the skill of fabricators and installers. We want to ensure we share that knowledge. All of our work is guaranteed and fully insured. Our tailored blend of state of the art technology and old world technique ensures your custom crafted countertop is cut to precision, meticulously handcrafted, and installed to your complete satisfaction. Because of our long term relationships within the industry, we're able to acquire top of the line surfaces from preferred suppliers at considerable savings to you. And just as important, we have a talent for pulling together compelling scenes that appeal to the soul. We put all of our focus on creating one masterpiece at a time…yours! What appeals to your soul? Serenity, drama, moderation, indulgence? Our policy of working with one client at a time allows us to become totally engaged in creating the ambiance of your desire. Whether we’re fashioning a kitchen countertop or an earthy surround for your bath, shower, jacuzzi or fireplace; we focus on creating an exquisitely handcrafted masterpiece with emphasis on satisfying your soul and defining your exclusive taste for luxurious living. All of our work is done by employees of National Granite We’re not connected with any affiliate, we're not a franchise, we don’t work on commission and we don’t outsource work to subcontractors. 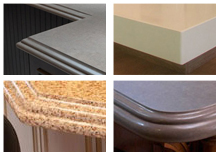 Our highly specialized teams are the crème de la crème of stone fabricators and installers. Our experiences include everything from customizing a single kitchen countertop to full customization and remodeling of a home's kitchen, baths, fireplaces, showers, Jacuzzis and vanities. We also specialize in tile floor and backsplash applications. We follow industry technical and design standards to the letter... We do everything by the book and we never cut corners by using insufficient tools and equipment or low-grade materials. That means you won’t wake up later to find that short cuts are costing you more time and money than you bargained for. We're not going anywhere... No doubt you've heard a tale or two of fly-by-night contractors who took the money, botched the job, then disappeared never to be seen again (you may even have a story of your own). Collectively, we've served your community for more than 20 years. By consistently providing some of the world's most spectacular surfaces, exceptional craftsmanship, sensible prices and exclusive VIP service, we've established a rapport with our clientele that conglomerate home stores don't even attempt to achieve...and we're not going anywhere! Let us be of service to you…We love to spoil our clients - and you'll love being spoiled by us! In order to give you the uninterrupted attention you deserve, client appointments are limited. If you're ready to have superlative stone countertops custom crafted and installed in your kitchen, please reserve an on-site estimate now (it's free and there's absolutely no obligation). Just click here to submit your request using the Free Estimate form or call 818-266-2252. You may also use the form to submit your design file by itself. Homeowners... SAVE an additional 25% (while supplies last) by submitting your request for a Free Estimate, or call now. Our number is 818-266-2252. Soul satisfaction guaranteed... view our online Gallery.